Today is Fionna’s 10th day in the outside world. I went into labour on 4th October at 18:15pm and Fionna Gillian Brown was finally born on 5th October at 13:50pm, weighing 3.5 kg or 7 lbs, 12 ozs. After four days in hospital, I was really ready to see our farm and all the animals again, although from my hospital window I had the most beautiful view of maple trees and I passed most days staring at Fionna and the spring sunlight through the maple leaves beyond. As the room was on level 4 of the hospital, it felt as though the room was literally in the canopy of the trees. It’s something I will always remember in terms of bringing her into the world. 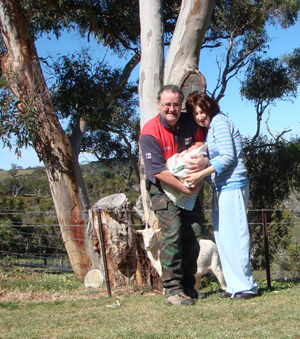 This is a photograph of us waking up on our first morning back on the farm as a family. I am still in my pjamas and Tara the goat managed to sneak into the photo which is quite cute. All of the animals have either bonded or ignored this latest little addition, and the farm is a strange place, resonating with the usual cries of roosters, chickens, goats, cows and now a human baby girl too. Being gluttons for adventure, we have managed to take Fionna out three times already in the 10 days of her life. Once to the local supermarket and post office, then to the local Saturday morning farmers market and a half-day trip today to Victor Harbor. I have to admit that I was slightly anxious about taking her out initially and this was why I so badly wanted to do it. The first expedition out saw me not being able to concentrate on anything but her and nor could I really relax. I felt extremely conspicuous with our newborn accessory and as everyone is drawn like a magnet to tiny babies you stop every few steps to answer questions and admiring sighs from friendly strangers. It’s lovely but a bit disconcerting when you are trying to blend into the crowd. After I got over that weird initial feeling, it’s better and today I even breastfed her on a bench in the main road in Victor Harbor and felt calm about it. Any niggling doubts about not having the confidence to feed and settle her in public have nearly gone now as I know I can manage to do it at this stage in a state of complete inexperience and first born clumsiness with her. Physically, I am still recovering myself (stitches & tiredness) but moving is so much easier when you don’t have 3.5 kg hanging off the front of you and it feels great! The spelling of Fionna with a double n is deliberate. Sgurr a’Fionn Choire (The Fair Corrie) is a mountain in the Cuillins on the Isle of Skye. Fionn in Scottish Gaelic means fine or beautiful. Richard climbed this mountain in the 1980s and we spent time on Skye together in the 2000s. Scotland is our favourite place in the world. When I was in labour I thought of the most peaceful place I could think of which was camping a the foot of Marsco on the Isle of Skye which is part of the same area. I also found out from my mum that her mum had wanted the name Fiona for me thirty years ago when I was born, so all in all the name really suits. Her second name Gillian is named after Richard’s sister.